The countdown has started to 2012 Election Day. 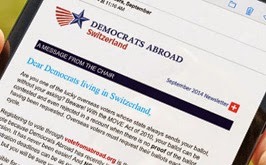 Join Democrats Abroad on November 10th for drinks and as much (or as little) political debate as you like. We're a fully open and inclusive group - we like your non-American and non-Democrat friends too, so come out for November's Talking Politics - the more the merrier!